Tension between police officers and civilians has risen to an all time high in recent years. Increased instances of police brutality and police involved shootings has also risen exponentially. Social media, smart phones, photos, videos, live broadcasts and news reports have brought these instances to the forefront like never before. This increased exposure is putting pressure on city officials to hold law enforcement officers accountable for the abuses against citizens within their communities. According to the website KilledbyPolice.com, over 1,100 men, women, and children lost their lives at the hands of police officers in 2016 alone. These statistics do not include acts of brutality and misconduct that were carried out over the past 12 months. What is most astounding about these numbers is the lack of accountability in most of these cases. In many cases, officers are cleared of any wrong doing although evidence clearly shows they were acting outside of their authority. Those that are charged see hung juries and acquittals. Those that are not affected by police brutality commonly will say, “Why should I care?”, “This doesn’t affect my life”, or “If they would have done what they were told, it wouldn’t have happened.” The truth is whether the person is the primary victim of police brutality, a friend or family member of the primary victim, a witness to the brutality firsthand, or heard about it on the news or so to say “through the grapevine”, they are a victim of police brutality. In 2016, days after citizens of the United States celebrated Independence Day, police officers in Baton Rouge, LA and St. Anthony, MN were caught on tape fatally shooting Alton Sterling and Philando Castile. Both were African American. Sterling was a son, brother, father of five, and locally known as the “CD Man.” Castile was a son, brother, stepfather, and a cafeteria supervisor at J.J. Hill Montessori Magnet School, whom was loved by the staff and students he severed for over fifteen years. In the age of technology and social media, news of their deaths spread like wild fire across the country and world. People filled with grief and outrage took to the streets in protest for weeks after. Some protests lead to fires, looting and destruction of property as well as multiple arrests. Sterling and Castile were not the first to have their lives abruptly taken by the police in 2016, nor would they be the last. Instances of police brutality, police involved shootings, and lack of accountability has done irreparable damage to relationships between police officers and the citizens in which they have taken an oath to protect and serve. It has heightened racial tensions and created a culture of fear and distrust of law enforcement in cities such as New York, NY, Cleveland, OH, St. Louis, MO, Chicago, IL, and uncommonly Erie, PA.
During the same week of the deaths of Alton and Castile, Cole “The Barber” Stewart, of Erie, Pennsylvania expressedhis feelings about the shootings on his Facebook page. His words were of anger yet were also outlined with hope that the United States would see an end in police brutality and police involved shootings. His post resonated with many. However, he began to receive a considerable amount of backlash from others. He took the post down to calm tensions but still felt that something should be done to show support to those that have been abused or lost their lives during police encounters. Stewart planned a peace rally for the date of July 15, 2016, which was the same week of Erie’s branded bike rally “Roar on the Shore.” After speaking to the local news stations about his plan, he began to receive death threats because people felt that his peace rally was actually a boycott of the bike rally. Stewart then received a phone call from the former police chief Randy Bowers stating that since “Roar on the Shore” was going on during that week, it would have not been a good idea to do the peace rally at that time. Stewart then decided to postpone the peace rally for another date. 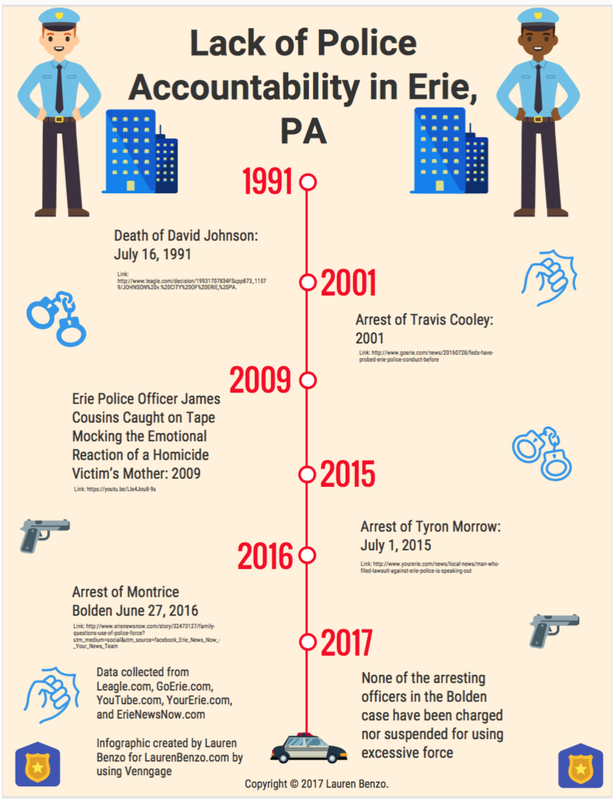 On July 18th, 2016, Erie News Now released a tape of 41-year-old Montrice Bolden, of Erie, Pennsylvania being “detained” by five police officers on June 27th, 2016 in the parking lot of TJ’s Traffic Jam. The video shows the officers punching and kicking Bolden in the face and body while other officers restrained him. His face was also slammed into the hood and door jam of the police vehicle. He suffered from a broken eye socket, fractured skull, internal bleeding, and permanent nerve damage on the right side of his body. According to the affidavit of probable cause, Bolden was allegedly in possession of a controlled substance while sitting in his vehicle parked in the tavern’s parking lot. The affidavit went on to say that, he allegedly “flicked” a lit cigar at the officer and attempted to flee. Although the cameras recorded the excessive force against Bolden, the alleged actions that were stated in the affidavit were not in the camera’s view. Bolden’s family and other community members began to question whether the officers went too far with their use of force. During the same month, Erie News Now announced that the United States Department of Justice System was investing the arrest of Bolden. Days after, the Mayor of Erie, Joe Sinnott and the former police chief Randy Bowers held a press conference stating that they will conduct an independent review on the force of the arresting officers. Bowers also stated that when he learned of Bolden’s arrest on June 28, he immediately assigned an internal affairs investigator to the case. Family Member and fellow “blue brother” to one of the police officers that were involved yet never charged in the death of David Johnson in 1991 misled the public to believe that the police department conducted any type of internal investigation. Bowers announced his retirement twelve days after Bolden’s preliminary hearing. 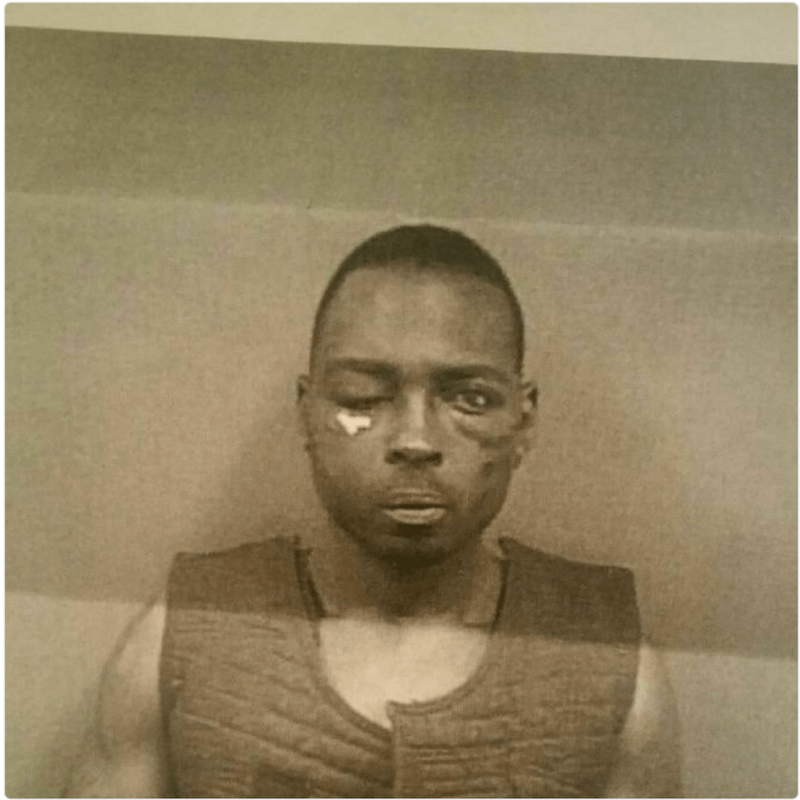 Bolden remains in jail suffering from the injuries he sustained during his police encounter. According to Bolden’s family, the Erie County Prison has repeatedly denied him access to see his neurologist. Yet, not one of the officers responsible for his injuries has been suspended or charged. Despite being investigated by the Department of Justice for civil rights violations, all of the officers are currently still on the street. The Citizens of Erie, Pennsylvania are now seeking solutions on how to bring an end to police brutality, bring more accountability to officers that use excessive force, and how to bridge the gap between the community and the officers that took a vow to serve and protect them. 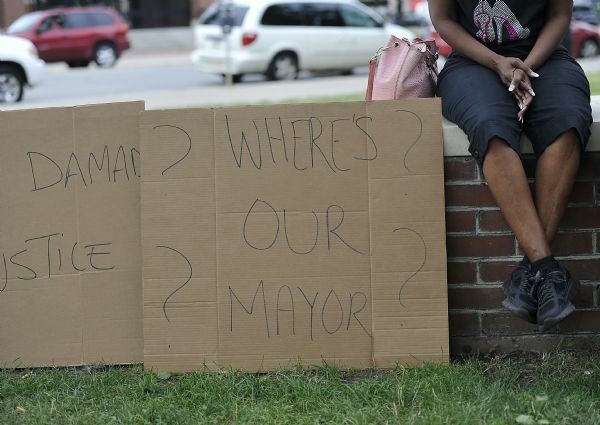 Let us begin with admitting that there is a lack of police accountability in the city of Erie. It has been over seven months since the arrest of Montrice Bolden and six months since the Civil Rights investigation was filed. Yet, all officers that are viewable in the video are still able to work on streets of Erie. Citizens that were able to see the footage and follow the case feel that if these officers were even suspended, they would have more trust in the justice system and the police department. LaurenBenzo.com reached out to the former police chief Randy Bowers, the new police chief Donald Dacus, the current Mayor of Erie Joe Sinnott, and various police officers from the Erie Police Department to seek solutions on how the city of Erie as a whole can bring more unity to the citizens and the police department. They have all declined to comment. Although Bowers, Dacus, Sinnott, and various police officers from the Erie Police Department declined to comment, five experts in various fields accepted the invitation to speak on these matters. These experts include an Erie City Council Member, a lawyer/Social Justice Activist, a Civil Rights Activist, an Associate Professor in the History Department of a renowned university, and a former mayor of the city of Erie. Here are a few suggestions for solutions and how they may help Erie, Pennsylvania as a whole. As a whole, the city can do this by newsletters, social media posts, foot patrol, neighborhood watch programs, and having active police officers living in the neighborhoods that they took an oath to serve and protect. The Harvard Law Review also stated in April of 2015 that The American Civil Liberties Union (ACLU) also repeatedly voiced its support for widespread adoption of this new technology, heralding body cameras as “a win-win” as long as civilian privacy remained properly protected. This has worked in similar cities, however, there seems to be a dispute about the use of body cameras for the Erie Police Department. There has been a discussion of the Erie Police Department wearing body cameras, yet there were some complaints on how the department would get funding for a building to store all the footage. Sonya Arrington stated that since she is a city council member, she would express the fact that these cameras are in need and she will find ways to fund a building that will store the footage. In December of 2016, The Fraternal Order of Police reached out to President Elect Trump and issued an advisory to their fellow members, stating what they are expecting from the Trump Administration once Donald Trump will be sworn in as the President of the United States of America. The Fraternal Order of Police expects the dismantling of some of President Barack Obama’s 2015 reforms. This includes his call for an increase usage of body cameras nationwide and creating a national database on police use of force. They are also requesting to remove some or all of federal aid to sanctuary cities and to lift the 2003 federal ban on racial profiling. Most police departments work off policies that contain a series of “Use-of Force.” These include Officer Presence, Verbalization, Empty-Hand Control, Less-Lethal Methods, and lastly Lethal Force. While many police departments state that these are the best ways to take out an arrest, John Olszowka, Ph.D. feels differently. The St. Louis University Public Law Review released an article called “Police Training as an Instrument of Accountability” and it states, “There may be a possibility of using training as a mechanism for how to enhance police accountability regarding the use of force may help more police departments in the future.” It seems as if new training will be worth a try. Yet, it is up to the Erie Police Department to decide if this will help not only their officers but to also gain trust between both parties. There are “good” police officers of all types of all races. Yet, they are the officers that personally know the extent of corruption and the type of “protection” that is offered to the other officers that are breaking the law. They are aware of the repercussions that they will receive from their fellow “blue brothers/sisters,” if they came forward stating the heinous actions that they witnessed. Everyone knows the saying, “One bad apple spoils the whole bunch.” This saying goes perfect with the fact that one corrupt officer can turn a whole squad bad. How can this stop in the city of Erie? The Erie Police Department can begin breaking down the wall by making sure the “bad apples” are extracted, not tolerated nor protected. The “bad apples” should be penalized for taking part in repercussions on officers that breaks the code of silence. Yet, in order for this to happen, the police department has to be willing to conduct these procedures. Attorney and former Mayor of Erie Rick Filippi was 36 years old when he took office. He took the oath of being the 50th mayor of Erie in 2002 and was voted PA’s Best Mayor in 2003 by PoliticsPA.com. One of his concerns while being the mayor was to help the community with the number of growing violence. He began community policing and was active at neighborhood watch meetings. He was the type of leader that showed the community that he cared. It seems this type of leadership has left after 2006 when Mayor Joe Sinnott took office. Not to mention, the violence in the city of Erie has been on a rise since. There is no doubt that the violence in Erie is a subject to put on the forefront. Yet, when the violence is happening, the mayor is silent. There are absolutely no comments on the violence in the city. There are no vigil appearances. There is hardly any public remorse for the families that have lost a love one to gun violence. Citizens of Erie feel if the leader does not care about the violence that is going on in the urban community, he does not care about the police brutality that is going on there also. In July of 2016, for the first time in years, Mayor Joe Sinnott held a press conference. This was not because of the gun violence in Erie, but this was due to the United States Department of Justice System investigating the arrest of Bolden. Along with former Police Chief Bowers, Sinnott stated that the Erie Police Department started an internal investigation long before the Department of Justice opened civil rights probe. As stated earlier, during the Bolden preliminary hearing, the prosecutions’ only witnessed stated that no internal investigation was ever conducted. So the community not only feels that he does not care about people of color, but he will also go on the record and give a deceptive statement to the public about conducting an internal investigation. The citizens of Erie will not have to think about what will be the future with Sinnott as mayor for long since the 2017 Mayoral Elections are approaching. Due to the city’s three-term limit, he will not be able to run again and a new mayor will be in office. Yet, before the citizens of Erie go to their designated voting locations, there has to be a deep analysis done on every candidate that plans to run for mayor. A great way for the city of Erie to have change would start with a new leader that is truly for the citizens he or she oversees. If there is a way that the citizens of Erie and the police department can bridge the gap, it has to start with a strong leader that is willing to put everything on the line to make sure the city is not only ran honorably but also truthfully.